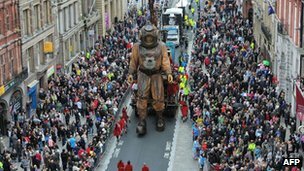 This weekend saw three giant marionnette puppets take over the streets of liverpool. Hopefully you where lucky enough to catch part of the three day spectacle. One girl, a Man and a Dog walked a total of 23 miles over the days to commemorate the sinking of the titanic. 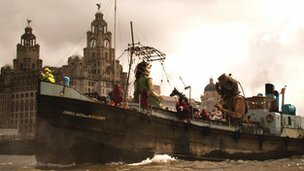 Even catching a ride on a boat down the Mersey, after 23 miles of dodging liverpools manic saturday shoppers i think i would be joining them. 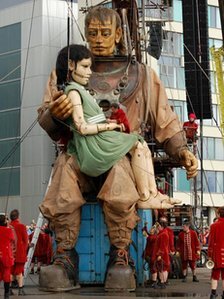 The event was created by French based street Theatre Company Royal de Luxe. Check out some of their work it truly inspiring…. the websites pretty flash as well. For those of you who are interested in what we did last Thursday . ‘The Ghost of Someone not yet Drowned’ performed by Julia Griffin, Karen Lauke and Helen Newall, with guest performer Michelle Mann. Took place at the stunning Victoria Baths in Manchester. We came along to help with the set up of designed installations. Thoroughly good professional, hands-on experience and well worth the effort everyone put in on the day! we were dead by the end of it! This entry was posted in Uncategorized by LAUREN MCGOWAN. Bookmark the permalink.